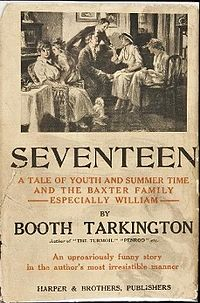 Having seen Booth Tarkington’s name mentioned in various places over the interwebs, I thought I would delve into his work and see what it was like. Somehow in the Lucky Dip of choosing, I ended up with this volume (written in serial form in 1914), and it was a fun little jaunt into earlier times and the mind of a young man who is deeply in puppy love with a visiting girl up the street. Tarkington has a good eye for teenaged angst, especially the more-innocent angst of the early 20th century: the glance that a girl (and the one you love) was loaded with meaning, your friends were everything to you, and your parents were just impediments to your social stature (although well meaning at the same time). Although this volume does not really have any deep meaning to it, it’s a fun and light-hearted satire of Young Love in Small town America during a more innocent time. (And – it must be said – it was also a lot funnier than I had anticipated.) It also reminded me of other “Prairie writers” such as Willa Cather, Sinclair Lewis et al. although not sure if they overlap time-wise and they are a trifle more serious, and his humor reminded me of Mark Twain’s Huckleberry Finn and Tom Sawyer (although they were published much earlier). Tarkington, however, was a writer of his times which means that there are some frequent cringe-inducing descriptions and dialogue of African-American help especially the Baxter family’s handyman called Genesis. It’s not surprising to read when one views in a historical context, but it still creates a jarring read to come across this so smoothly integrated into an otherwise really good book. Outside that, I enjoyed the read. Tarkington had a great sense of humor that came through in his portrayal of Willie and his tormented love life that summer. Tarkington ended up being quite a prolific writer and was named by Publisher’s Weekly as “the most significant contemporary American author” in 1921. Additionally, he was awarded the Pulitzer Prize two times, once in 1919 for The Magnificent Ambersons and once in 1922 for Alice Adams, neither of which I have read but I think I own the earlier book. I’ll need to check the bookshelves….